The Fowler 4F 0-6-0 was a very basic but useful design of steam engine. J Crosse recounts the history of a surprisingly long-lived class. This October marks the 50th anniversary of the withdrawal of the last of a long line of Henry Fowler-designed 4F 0-6-0s – a type which now dates back 105 years since Midland Railway No. 3835 rolled off the production line at Derby. (Nos. 2231-50 and 3200-3219) having later build dates. Previous Post:The new narrow gauge record! 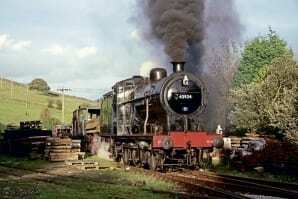 Next Post:£1m government grant aid bonus for heritage lines!